As a signatory of the EU Habitats Directive, Ireland is required, under Article 17, to submit National Conservation Assessments for all Annex I habitats within the country every six years. Working on behalf of the National Parks & Wildlife Service, BEC Consultants made a major contribution to the 2013 deliverable, conducting the assessments for 26 of the 58 Annex I habitats reported on. This comprised ten upland, ten coastal, four grassland and two woodland habitats. Our contribution to the 2019 submission was even more significant with National Conservation Assessments for 34 Annex I habitats and four Annex II plant species completed. This comprised 15 coastal habitats, 10 upland habitats, four woodlands, three grasslands, limestone pavement and juniper scrub. Additionally one staff member was seconded to National Parks and Wildlife Service to assist with the final deliverable of the 2019 submission, and the company made significant contributions to the National Conservation Assessments for whorl snails (Vertigo spp. ), marsh fritillary (Euphydryas aurinia) and sea cliffs. The assessments involve the collation and processing of all available data relating to the distribution of these habitats and compiling these into a GIS. From this, the distribution, range and area of each habitat are calculated and compared against data from the previous reporting period. 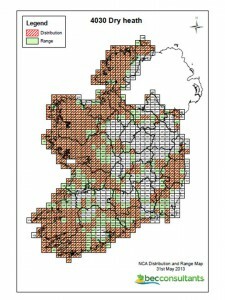 Threats and impacts are detailed, together with notes on the Irish interpretation of the Annex I habitats. All data are compiled to a format agreed at a European level. These assessments require expertise in data handling, spatial database creation and management and dataset cleaning and verification, such as dealing with overlaps and inaccuracies in the datasets. This demonstrates the company’s expertise in working with large GIS datasets and also the wealth of expert knowledge of BEC Consultants’ staff on Annex I habitats. NPWS (2013) The Status of EU Protected Habitats and Species in Ireland. Habitat Assessments Volume 2. Version 1.0. National Parks & Wildlife Service, Department of Arts, Heritage and the Gaeltacht, Dublin.